Thank you so much for having me on your beautiful blog. I really enjoyed your questions. The pleasure was all mine. You have an incredible imagination.I'm doing a huge happy dance for your new release, Viking Fire. Have a wonderful release day. Andrea- I was very touched by your story. You shared some pretty intimate things with us and I thank you for that. I had fertility problems, too, and now have an eighteen year old and sixteen-year-old triplets! Try to get writing done with those hormones floating around! I was also moved by what you said about your ex ridiculing your work. What a jerk! I have been blessed by being supported by my husband and family and it hurts me to hear other writers talk about people belittling what is so much a piece of your heart. I also, unfortunately, identified with your talk about losing weight. My husband and I are doing the COMBAT workout, but it is always a struggle. Thanks for sharing yourself and I wish you all the best of luck with your work! Wonderful interview, Andrea. It was great learning more about you!! I love your covers!! Tweeted. It is so nice to see you here. I agree that Andrea's covers are just beautiful. Thanks so much for stopping by for a visit. Hugs! Thank you. Crimson Romance did a wonderful job on them. Glad you could stop by and thanks for sharing. 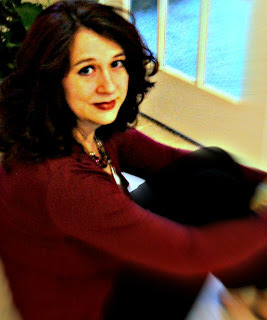 Thanks, Nancy,for having Andrea on and continuing your dream series. I love it! I love the dream series because I find it so inspiring. I agree with you about how cruel it was for Andrea's ex to laugh at her writing. I am so blessed with family that supports everything I do. When I read that paragraph, I just want to place a well deserved kick ... well you know where. It takes a very strong person to rise above something like that and I take my hat off to Andrea for not allowing anyone to get in the way of her dreams. Thank you Nancy. I know where he lives if you want to stop by :) just kidding. Super interview! Always fun to learn more about my fellow authors! Thank you D'Ann. I'm glad you could stop by. Such an heartwarming and intimate interview. Thank you for sharing. So glad you didn't give up on your dream, Andrea. Keep following your passion! Congratulations on reaching your dreams, my fellow Texan and mother-of-three! I loved Viking Fire and really need to read Garnet Dagger. Thank you. I'm glad you enjoyed Viking Fire. I hope you like The Garnet Dagger - it's edgier and darker than Viking Fire. Lovely interview, ladies. 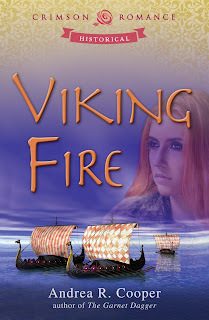 I can't wait to read Viking Fire! I've got Viking roots that wend their way back to the Middle Ages, so the novel has been calling to me. May you have much success, Andrea, and many, many sales! I may having Viking roots too ;) McLaughlin (my great-grandfather's name is thought to be from Lochlann which is Gaelic for Viking). Let me know if you want to do a review swap for Viking Fire. What an amazing interview. Thank you for sharing with us. And your excerpt was fantastic--your book sounds fantastic. I'm glad you enjoyed the excerpt. Thank you for stopping by.